Neil Corbett utilizes the advice from Viva Editions' author Pam Withers in his recent article for the Maple Ridge News from her sit-down at the Maple Ridge Library as she discusses why it is important for young boys to be reading for fun. Why is it so tough to get boys to read? Neil Corbett of the Maple Ridge News uses the advice of esteemed author Pam Withers and her book Jump-Starting Boys: Help Your Reluctant Learner Find Success In School and Life in a recent article published on March 17, 2015 from a sit-down at the Maple Ridge Library. Withers was recently invited to discuss and figure out why this problem occurs as well as share her advice for how it can be remedied for the future. Corbett observes a lot of Withers' helpful tips, such as limiting their screen time to reading aloud with them every single night, to give examples of how to get all young boys to feel excited about reading. 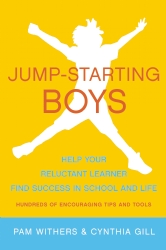 Jump-Starting Boys is the first book on the market that empowers parent readers, give them a sense of being able to reclaim the duty and rewards of raising their children and assuring them they really can mitigate and/or work with the influences of school, media and more. Instead of footnotes, graphs and case studies, Jump-Starting Boys has heart-warming true stories and take-action checklists. Filled with reassurance and support, the authors turn fear and guilt into can-do confidence. Through easy tips and action list sidebars, this is the most practical, readable book on the topic, and positivity is the watchword. Pam Withers is the best-selling, award-nominated author of more than a dozen adventure novels particularly popular with teen boys. They include Peak Survival, Skater Stuntboys and Vertical Limits. She lives in Vancouver. Her book Jump-Starting Boys: Help Your Reluctant Learner Find Success In School and Life is available in print as well as audiobook.